So much of your health comes down simply to what you eat. Proper meal planning can help you to keep better track of what you eat and ensure the healthiest choices. When building a meal plan, especially for a diet to control cardiovascular disease, there are some priorities that can help to make your plans more successful. Before you start any new diet or lifestyle change, you should always talk to your doctor. Not only that, but your doctor might have some great tips for you to get started. He or she may even be able to give you some ideas of what foods to avoid, and which foods to prioritize. It is best for you if you don’t immediately head to the grocery store. Before you head out to the grocery store, do your homework first. Take some time to look up delicious, heart healthy recipes and plan what you want to eat for the week. Then, so you know exactly what ingredients you will need, make a detailed list based on what you need for your meal plan. Making preparation a priority will help you stick to buying the best heart healthy foods. Where you shop and what part of the store you frequent is a priority that many people do not consider. When you are at the grocery store, you should stick to the outer aisles for the majority of your shopping trip. Typically all of the healthiest foods and ingredients will be found around the perimeter of the store, especially near the produce section. As part of your healthier diet to control cardiovascular disease, you want to avoid processed foods and many fats. Instead, plan to fill your cart with lots of fresh produce. Often people find that they eat healthier meals, but then still eat unhealthy snacks simply because they are not sure what to eat. Although each snack may seem harmless, they can really add up and hurt your heart healthy diet and for this reason they should be considered a priority. Instead of letting yourself fall victim to the “it’s only a snack” mindset, set yourself up for success by planning healthy snacks. Fresh fruit, vegetables, pretzels, and other healthier options are delicious and you’ll find them to be more filling than your usual chips or cookies. A lot of times people make poor decisions when they are hungry, tired, and unprepared. Once a week, after you’ve done your grocery shopping and have your meal plans and recipes ready, go ahead and do prep work like chopping veggies, etc. You’ll be surprised how easy and fast putting together a good meal will be. 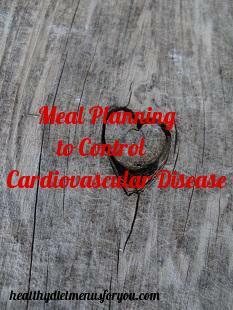 These meal planning priorities will help you build and maintain a meal plan to help control cardiovascular disease. Simply planning ahead, shopping right, and staying prepared can make all the difference in putting together your heart healthy diet. No more guess work will make your meal planning successful. Click here for more ideas to control cardiovascular disease. High Blood Pressure Diet: What Should I Do?